Bonfire MUST be attended at all times. Precautions must be taken to ensure all attendees, especially children, are kept at a safe distance from the bonfire at all times. All other normal beach regulations, such as, but not limited to: driving on the beach, consumption of alcoholic beverages, time parameters, pets, etc. shall be adhered to. Groups under the age of 18 must be chaperoned by an adult twenty-one (21) years of age or older. The permit will be issued only to the chaperone, who will be responsible for compliance with the requirements for the bonfire. The person obtaining the permit must be present during the hours of the bonfire. They must have in their possession a copy of this permit (paper or digital) and present it upon request of a Fire Official or Police Officer. The Town of Ocean City reserves the right to check for permit compliance at any time. Flammable and/or combustible liquids must not be utilized for igniting or fueling bonfires. 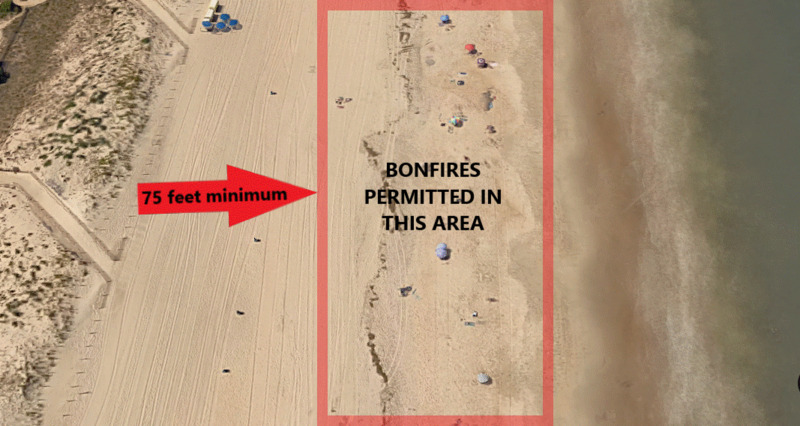 Bonfires are permitted only on the beach near the water and a minimum of 75 feet from the dunes. The fire must also be a sufficient distance away from beach boxes, lifeguard stands and other potentially combustible items to avoid possible ignition. Unsuitable wind or weather conditions must be taken into consideration prior to and during the actual bonfire. Adverse conditions may cause the revocation of this permit. Servicing of the bonfire site will be accomplished by hand carrying the equipment and supplies to the site. Vehicles shall not service the bonfire site. Bonfires may be no larger than 3 feet high and 4 feet in diameter, and must be placed in a pit approximately 1 foot deep. Cleanup and restoration of the site must be completed by the expiration date and time set forth by this permit. All ash and leftover material must be thoroughly wet down, allowed to cool, and placed in a metal trash can and disposed of in proper container(s), and the fire pit leveled to return the beach to its previous status. MATERIAL AND/OR ASH SHALL NOT BE BURIED IN THE SAND OR THROWN IN THE OCEAN. Bonfire site will be inspected post cleanup. The permittee may be billed additional fees for the cost of response/cleanup in the event of failure to properly cleanup from the bonfire. Future bonfire applications may be denied due to previous improper cleanup. All persons encompassed in this permit must vacate the bonfire site no later than the date and time set forth by this permit. The Town of Ocean City’s Department of Public Works cleans the beach each night from 6pm to 3am. When you see a beachcomber tractor approaching your area, please be mindful of them and bring your crowd in closer to the bonfire so that they may properly clean the beach.